The closer we come to inventing a viable tractor beam - a ray of light that can move objects - the more obvious it is that real tractor beams will not look anything like the glowing blue rays from science fiction. So how will beams of light actually move matter? Let's find out by looking at three ways that scientists can already move solid objects using nothing more than light. At the moment, development is ongoing on several different types of technology - and not all of them really deserve the title of tractor beam. Take the laser thruster engine, which is activated by a laser beam, but moved by traditional propulsion. The concept is based on an experimental motor, where lasers fire pulses into solid propellant, shoving the propellant out of the craft in one direction to thrust the spacecraft the opposite way. With multiple propellants, the craft can be steered in different directions-and if the engine is modified to allow an external laser pulse to trigger the propellant expulsion, the engine can be steered by an outside source. With some modifications, these thrusters could be attached to space junk that needs to be pushed out of orbit, or even to an astronaut's suit so an adrift and unconscious astronaut could be steered to safety by shipmates. But in a laser thruster engine, the laser itself is not pushing the object, merely triggering an engine that does all the work. 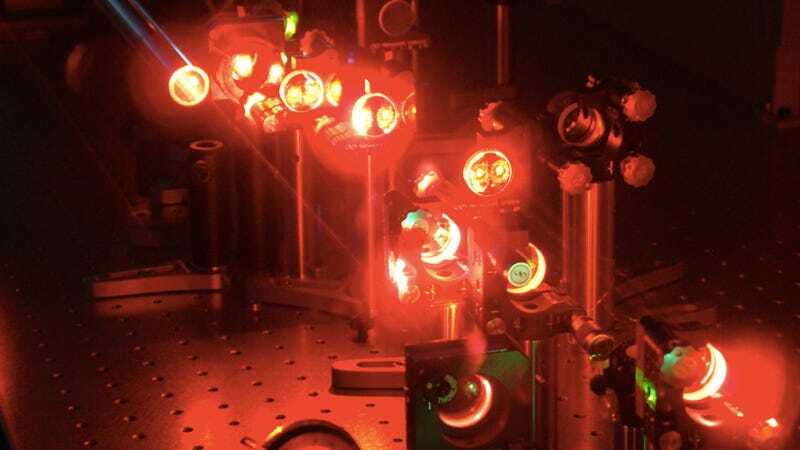 Optical tweezers, on the other hand, actually move objects with the power of light alone. Although the photons that make up a focused beam of light have no mass, they do carry momentum, and when they hit an object and are forced to bend around it, their direction, and therefore their momentum, changes - which means that the object feels a miniscule force as part of conservation of momentum. In an "optical trap," a focused laser beam, more intense at the center, is pointed at a miniscule particle ranging from 10 to 100 nanometers long. As the particle deflects photons and they scatter around it, they also are holding it in place in an optical trap. By moving the laser beam, researchers can actually move the particle as well. These "optical tweezers" have been used to confine cells, track the motion of bacteria, apply small forces, modify cell membranes, and study molecular motors. Despite the many applications of optical tweezers, manipulating objects with lasers is a lot less cool when those objects are so small. Another technique improves tractor beams' abilities, moving glass beads a hundred times the size of the nanoscale objects that optical tweezers can push around. Rather than relying on the momentum of photons, this method uses their heat. A laser beam with a hollow center - two counter-propagating beams of light are overlapped so that they cancel out in the middle - is focused on a tiny glass bead so that the air around the bead remains cool while the air molecules farther away are heated by the laser and bounce around much more quickly. When the bead drifts into the hot air, it's like moving into a mosh pit of hot air molecules: the frenetic motion quickly pushes the bead back into the still, cool air in the center of the laser beam. The bead can also be pushed along the length of the composite hollow laser beam by changing the intensity of the contributing lasers, heating the air on one side of the particle and pushing it along the beam with different velocities. This successful technique is estimated to be able to move small objects up to 10 meters in air - but because of its reliance on air molecules, it would not work in the vacuum of space. Clearly, lasers can successfully push small objects along, but pulling them is another story. A couple methods deal with this hurdle by manipulating specific kinds of objects. For example, if the object can be induced to carry an electrical charge, the laser can drag it a short distance. But the most promising technology for pulling an object with laser light is that of Bessel beams. While the cross-section of an ordinary laser looks like a filled in circle, the cross-section of a Bessel beam resembles a target, a set of concentric circles. The innermost circle of a Bessel beam also remains focused for longer than a typical laser would. Bessel beams can even travel through objects, rather than being stopped by them. All of these traits make Bessel beams ideal for tractor beam applications. For example, the increased focus of a Bessel beam makes it better suited for pushing on just part of an object, rather than the whole thing, increasing control of the object's movement. In addition, because a Bessel beam moves "through" objects, reconstructing itself on the opposite side, the light waves that make up the beam cannot only push the object, but they can also superimpose with a separate light source in order to build up more energy on the far side of the object than the near side, pulling the object toward the laser source. This nifty trick lets a Bessel beam both push and pull an object. Could we be on the verge of inventing tractor beams? Although tractor beam technology continues to advance, it remains primarily limited to very tiny objects. So by all means, dream of tractor beams - just don't dream too big.